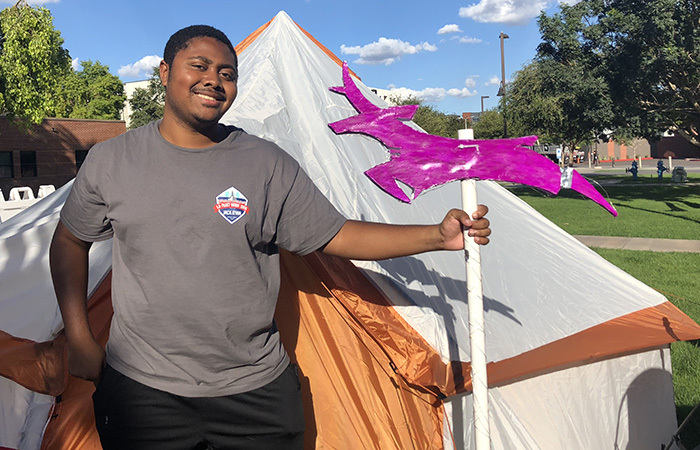 After surviving a mid-night ant attack, Myles Williams showed off his tent and his Lopes sign. 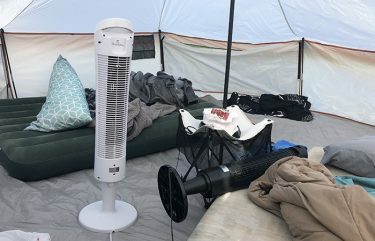 The Lopes Motel tent with cooling fans to ward off heat-seeking ants. It was dark, humid and well after midnight when the residents of the Motel Lope tent were all talked out and ready to sleep. One cell phone alarm was set for work at 5 a.m., another was set for an 8 a.m. class. As the guys sleepily settled into their blankets and sleeping bags, they were startled by a colony of ants, crawling up their ankles and down their arms. They jumped to their feet in disbelief, turned on the flashlight feature on their cell phones and started sweeping the insects out of the tent. Wearied with fatigue, they were exasperated to find even more ants. The night the ants attacked is a story they will tell their friends, their parents and, as the years go on … their children and grandchildren. It is what makes college special, a unique time of heightened socialization, living independently among peers. A view of the record-setting 168 tents. In this case, the night the ants attacked is part of the lore of Camp Elliott, a growing narrative keeping pace with its expansive population. 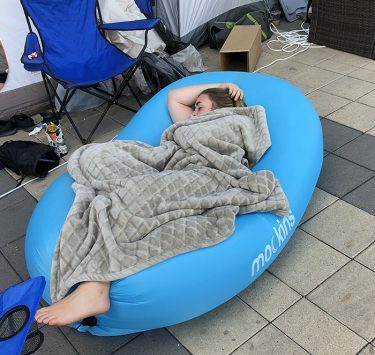 On Thursday night, a record 168 tents and 846 students took part in the spirited event, so-named for Daniel Elliott, the first student to sleep overnight in anticipation of Midnight Madness. From that first tent in 2015 to a previous record of 89 tents last year, Camp Elliott’s popularity stems from the desire for community – with people, as opposed to ants. Trent Bowman slept on “soft cement” and Ryan Barnes slept on a bean bag. On Wednesday night, he and his pals munched Habit burgers and watched the New York Yankees-Oakland A’s baseball game on the massive outdoor screen that overlooks the quad. Daytime sleeping was common after long nights of fun. A few yards away, Trent Bowman also experienced “remembered happiness,” a term coined by famed psychologist Daniel Kahneman. What was Bowman’s motivation for surrendering the comfort of his targeted pressure point, extra-length mattress in his residence hall? Sydney Neuman and Kalie Chambers in their luxury tent. 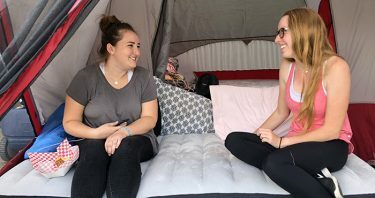 Ten yards away, Sydney Neuman and Kalie Chambers typified the opposite of roughing it. 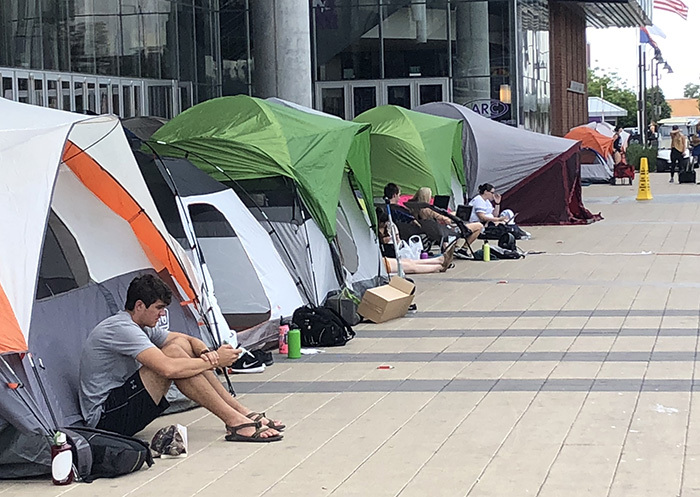 They stocked up on thick air mattresses, electric fans and mega pillows, making their tent near the entrance to GCU Arena a home away from home. 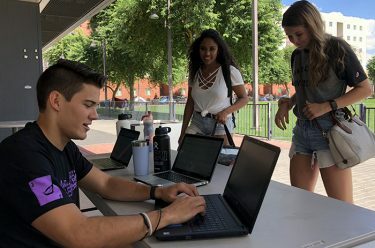 Havocs leader Tannor Bach checks in sophomores Brianna Forbes and Jourdan Snyder. Like the Peanuts comic strip, adults were scarce at Camp Elliott. Peer organizers, in the form of 10 Havocs leaders, worked lengthy shifts over the 46-hour period, including ensuring a fair numerical system for entry into Friday night’s Midnight Madness at 11:15. 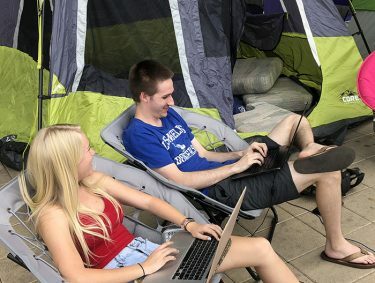 “We still check the tents at night and we’re still running everything, but we camp along with the students to form bonds with them and build relationships,’’ said Havocs leader Claire Belmear, a sophomore from Durango, Colo. The organic mingling, singing, movie watching and game playing gave way to organized spirit on a few occasions: a Havocs video filmed very late Thursday and a visit from ABC Channel 10 very early Thursday. Daniel Avila played Worship songs day and night. 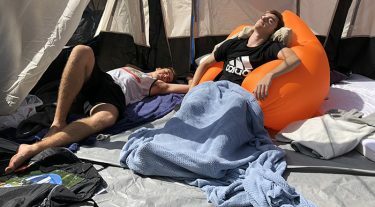 “I slept well until 5:30 a.m. when everyone had their cheering thing, and then I could not get back to sleep,’’ sophomore Andrew Rosenthal said. Daytime sleeping was at a premium early Thursday afternoon, when students who stayed up most of the night scurried back to their tents after morning classes. 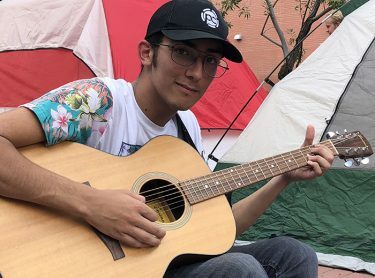 Singing worship songs was the highlight for Daniel Avila, a freshman from Fresno, Calif., who learned about Camp Elliott last year on his Discover Trip. Carli Young and Josh Chamberlain complete homework. Mallory Tapia is not known for her swimming expertise, but her determination to secure a front-row seat for Midnight Madness prompted her to solve the Havocs riddle by diving into the Grove pool, finding the Joker card and winning a free ticket for herself and her friend Carli Young. In turn, Young lent her tent to senior Josh Chamberlain and his friends.